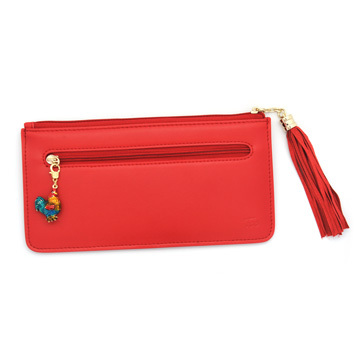 This beautiful red rooster wallet is a lovely vibrant red color – red is the feng shui color of good fortune – and has an excellent rooster keychain attached to a zipper, and a red tassel. Red also symbolizes the element of fire: the element of prosperous luck in 2017. Inside the wallet, positive mantras will help you fulfill all your wishes and endeavors for the new year. This red rooster wallet is the perfect accessory for enhancing one’s prosperous luck, wealth luck, and positive chi for the 2017, Year of the Rooster. The wallet is also the perfect gift for all friends and family. The rooster charm can be used for good fortune in the new year, and can be used for protection against infidelity and attacks from enemies. The fire element, manifested as red color for this wallet, is very important for bringing supportive friends that can help you overcome obstacles for the year. You should tap the auspicious energy of this wallet by placing your credit cards and cash in it. Carry it throughout the year to create a year of abundance and harmony. The dimension of the feng shui wallet is approx. 4 1/8" x 7 3/4" and made of PU leather. In 2016, the Dragon brings harmonious energy to the Year of Monkey, which is beneficial for creating good vibes of prosperity and business growth. This wallet is specially designed to maximize positive energy that will bring one success and financial luck for the Year of the Fire Monkey. The fire element, manifested as red color for this wallet, is very important for bringing supportive friends that can help you overcome obstacles for the year. You should tap the auspicious energy of this dragon wallet by placing your credit cards and cash in it. Carry it throughout the year to create a year of abundance and harmony.